Born in Oak Creek, Colo., 21 November 1921, He earned a BS from the University of Nebraska, Omaha. He also earned degrees from U.S. Army Command & General Staff / College & Army War College, and Department of State Foreign Service Institute. Col. Ugalde served thirty-three years on active duty service in the U.S. Army, retiring in February 1973 at the rank of Colonel. He served in WWII in Africa, Sicily and Italy. In Sicily he was promoted “on the spot” to Captain by General George S. Patton for outstanding leadership and bravery in a particularly hazardous yet successful operation. He then served in the Korean Conflict and multiple tours in Vietnam and command positions in Colombia and Venezuela in South America. 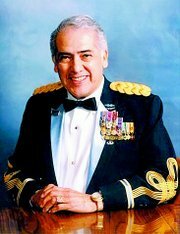 After retirement, Col. Ugalde served as Director/Secretary, California State Department of Veterans Affairs in 1985-1991. He also served as President, National Association of State Directors of Veterans Affairs. He was named a commissioner to establish the Vietnam Veterans Memorial and Six State Veterans Homes. He served as Chairman for the Veteran Memorial Center, Inc. of San Diego, Chairman of the Veterans Memorial Park Committee, and Chairman of the Veterans Cemeteries Committee.